Project Genesis is a strategic sustainable development framework for Morocco to translate from being a net importer of energy and a country facing water shortage issues, into the number one producer both of clean renewable energy and water in the region. 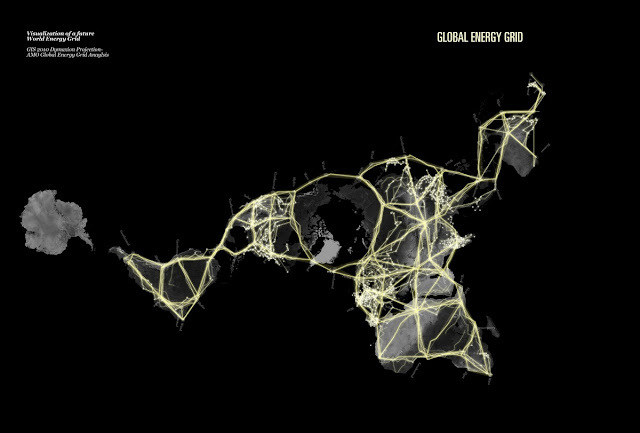 Personal Notes : The full potential of regional Supergrids lies not only in the possibilities they offer their member countries, but also in interconnecting with other similar grids such as the existing European Supergrid or this new Asian one. We have to be ready to make the leap into a new and integrated way to manage energy resources on a global scale. At any rate, a Northern African Supergrid has a lot of potential in regard to its future integration with the European Supergrid and possibly as far as Asia in the future by connecting to a Middle Eastern Supergrid. The vision of Buckminster Fuller edges each day closer to reality. The Desertec Foundation and the Japan Renewable Energy Foundation (JREF) have entered a memorandum of understanding (MoU) to promote an Asian supergrid necessary for the expansion of renewable energy in Asia. The aim of the MoU is to accelerate the deployment of renewable energy, and the two foundations will exchange knowledge and know-how, and coordinate their work together to develop suitable framework conditions for the deployment of renewables and to establish transnational cooperation on a supergrid in Greater East Asia. The vision is an interconnection of the national grids of Japan, Korea, China, Mongolia, and Russia with high voltage direct current (HVDC) transmission lines. The Desertec Foundation says it sees this supergrid as an important step towards the implementation of its Desertec Concept in Greater East Asia and has already conducted a feasibility study on potential grid corridors to make best use of the region’s desert sun. JREF was founded in the wake of the Fukushima Nuclear Accident to prevent any further such events happening again. Its mission is to efficiently accelerate deployment of renewable energy in order to reduce costs and boost Japan’s economic development. 'And He Hath Constrained The Night And The Day And The Sun And The Moon To Be Of Service Unto You'. The Holy Kuran. This blog is meant as a compendium of my research, findings and thoughts concerning the viability, feasibility and opportunity of harnessing renewable energy to attain sustainable development in Morocco. Morocco plans to invest $12 Billions in solar energy alone to develop 2000 MW of capacity by 2020. Similar efforts are vested in wind energy with another 2000MW of capacity by the same time frame. Harnessing renewables energies and accomplishing its full potential of clean energy, the Kingdom could evolve in a matter of years from being a net importer of energy and a country facing water shortages issues, into the number one producer both of clean renewable energy, water and essential food stuffs in North Africa region. This vision relies heavily on the prime geostrategical position of the country and of an exceptional proximity to large energy and water markets such as Europe, and the MENA. Projections indicate global electricity demand will increase 80% by 2030, as for water several countries are already facing shortages and the trend seems to be on the rise. Nuclear is a viable green energy.